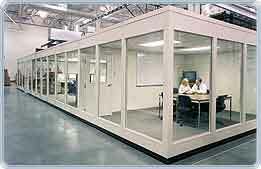 Modular Conference Rooms & Prefabricated Meeting Rooms Installed Nationwide. One of the most important aspects of management is communication, and in order to effectively pass information between staff and suppliers, it is vitally important to have space within the workplace where you can all get together and talk. In a business that specializes in production, it can sometimes be difficult to have space within the workplace where you and your staff can get together, however with the range of modular conference room solutions that Easy Rack offer, it is now possible to achieve your goal of having high quality modular meeting room space right in the heart of the working environment. There are a huge number of benefits of having a modular conference room right in the heart of your factory floor – or for that matter anywhere else within your business. Being close to production staff or other operators means that during business critical meetings, a sense of the actual purpose of the company is present, and this can help with focusing the meeting on the most important factors. 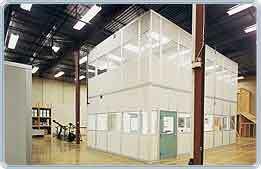 Modular meeting rooms and conference rooms from Easy Rack offer a number of advantages to your business. They give you the comfort and convenience of having a dedicated meeting space along with the ease of construction offered by using modular technologies and techniques. The rooms can be entirely customized to meet the exact needs and décor that is used in the rest of your building creating a businesslike environment within which your management team or staff can exchange ideas easily and in comfort. Another major advantage offered by a modular solution is that in the future as the needs of your business change, the components of the conference room can be moved around and the whole structure can be changed to reflect your needs. The panels that make up the walls of the modular conference room can be moved around, dismantled, and changed so that the room can be adapted to meet your requirements going forwards. Whereas some modular conference rooms have a reputation for low quality finishes, or for being noisy and drafty areas that do no properly insulate the space against the surrounding area, the meeting room solutions available from Easy Rack offer the highest possible quality and convenience. Three inch thick walls or double layer panes of glass in the windows mean that the room is well enough protected from the surrounding environment to allow for meetings to take place in comfort, even in the middle of a busy factory. Using Modular construction rooms means that you can specify the exact dimensions of the space along with any additions such as lighting and power supplies in advance, and have the various components needed delivered right to the site. All the building work is carried out off site, and the panels arrive at your business ready to be bolted into place, and the room can be used almost instantly. Rather than needing to employ a variety of different tradesmen to come and complete the work, the factory staff will complete all of the work needed at the manufacturing site, and deliver you all the parts needed for a modular meeting room.